Black Ice Software - Tiff Viewer 11.15 is released! Tiff Viewer 11.15 is released! Redesigned Ribbon menu and Status bar for a better user experience! The Tiff Viewer version 11.15 includes a new redesigned Ribbon and user interface with a Status bar for easier Zooming, Viewing and Navigation on the screen for a simpler user experience. 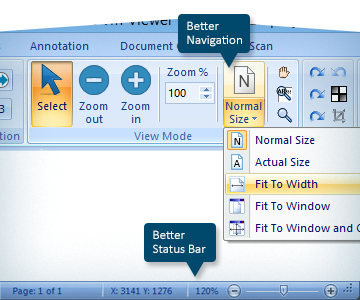 The latest release of Black Ice Tiff Viewer includes improvements for printing multipage Image PDF documents, and improvements for saving, naming and converting Dialogic, GammaLink Fax formats. Additional new features in version 11.15 of Tiff Viewer are an improved scrolling speed, when using mouse wheel and includes updated manuals.